FTC Disclaimer: All links in this post are affiliate links and I will be compensated if you make a purchase after clicking on my links. I was compensated for this post. 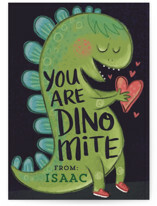 It’s almost Valentine’s Day and I am in totally in love… in love with these unique and adorable kid’s Valentine’s Day cards by Minted.com! These fabulous cards are sure to make your child popular as classmates delight in the silly messages and original images. 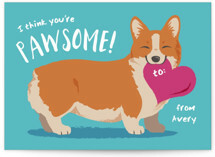 Check them out below and don’t forget that you can get them shipped FREE with priority shipping if you enter code BEMINE2019 at check out. The valentine’s I have picked and shown below are my personal favorites but there are so many more, including cards with special shapes and photo cards. I really love them all! Each card design comes in several colors so I encourage you to check out each one for a closer look. The cards also have an option for having a wavy cut edge, adding custom stickers that match, and choosing what kind of paper they will be printed on. Love this llama graphic. Features a “cool” llama wearing heart-shaped sunglasses. 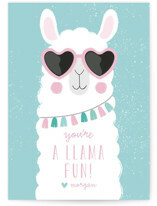 The message reads “You’re a llama fun!” The background and llama’s outfit changes with different variations so make sure to check them all out and pick your favorite one! 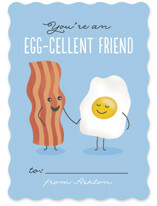 Features an illustration of a happy piece of bacon holding friends with his fried egg of a friend. Really cute! Message says “You’re an egg-cellent friend” and there is a designated area to write the name of the recipient. 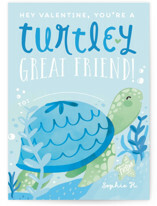 This card features a happy turtle chilling amongst some seaweed. I love the watercolor-like style of this art as well as every single color variation that it comes in. I bet you’ll need to think hard about which one you like best, too! A cool card for a cool kid. This Valentine’s Day card features an illustration of a large manta ray swimming among schools of fish. 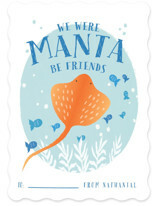 The message reads “We were MANTA be friends.” I love it. I have never heard this pun before – it’s so original! For the kid who loves cars and monster trucks, this awesome card is perfect. 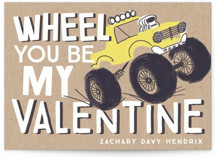 It features a totally cool monster truck rollin’on through with the message “Wheel you be my valentine”. Don’t hesitate to make this Valentine’s Day an extra special day for your little one! They will absolutely love having a special personalized card to give out to all their classmates and friends. How cool! P.S.. Don’t forget to check out the STICKER section! 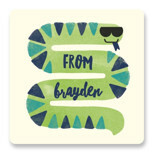 They are fun personalized stickers with your child’s name on them (you can get some that match your Valentine’s Day cards). I sure wish these were around when I was a kid..